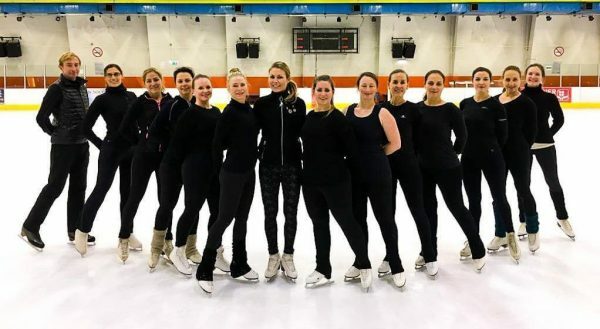 Team is collected from ex-synchronized skaters as well as other ladies, who have passion for this sport and have been skating for few years as hobby already. We practice once in a week on Tuesday at Stadthalle; first 50 minutes off ice training 20:00-20:50 and then 50 minutes ice practice 21:00-21:50. We have fun on ice together while repeating basic skating and learning new skills too. We practice also synchro elements as well as pair elements. Season 2018-19 has started. We are planning to take part in competitions this season and we are looking for few more new skater to share this great opportunity with us. If you want to try this inspiring sport, come and join to our team! All you need is a little bit experience of skating and motivation to learn new things on ice. Spring practices on Saturdays in Stadthalle at 18:30 off ice training at 19:00-19:50 ice practices.